KANSAS CITY, Kans. (October 21, 2016) — Brad Sweet steamrolled ahead Friday night to his eighth win of the World of Outlaws Craftsman® Sprint Car Series season at Lakeside Speedway. The O’Reilly Auto Parts Rumble on the River did not only give Sweet an advantage to finish the season’s points race in the top-three, but the victory also snapped a 33-race drought for Sweet. Sweet had not won a feature in the series since Badlands (S.D.) Motor Speedway on July 2. His best finish at Lakeside came in June 2014, when he placed sixth in the feature. Sweet started on the pole for this year’s 30-lapper, which initially put him in position to break his winless streak. In the opening lap Ian Madsen, who started second in the feature, claimed Sweet’s spot in turns one and two. However in the five-caution feature frenzy, yellow flags prevented any of the three race-leaders throughout the race from putting any comfortable cushion between them and the 24-car feature. Though Madsen survived the race’s first restart on the third lap, it gave other drivers the chance to make their move. In turn four of the best lap Joey Saldana, seeking his 100th career series win, joined Madsen and Sweet in a three-wide drag race down the front stretch for the top spot. Saldana managed to overtake both of them and led nearly the remainder of the first-half of the feature. With two laps before the halfway point – and the race’s fourth caution – Sweet challenged Saldana riding the bottom of the track. Closing into the second half of the race, the front of the pack caught up to the back. Saldana, with less than a half-second lead at the time, got swept-up in the traffic, leaving Sweet enough room to claim the top spot. The top-five underwent its biggest shuffle on the fourth restart, as Daryn Pittman led the charge into second position Pittman, who started third in the feature, regained a podium spot in turn two and through the backstretch overpowered Saldana. Logan Schuchart, with his most recent win the race before, followed Pittman’s charge in his No. 1s Bobby Allen Triple X racecar. Though Pittman carried momentum through that sequence in his No. 9 Kasey Kahne Racing with Mike Curb GF1 winged-sprint, the race’s final caution on lap 19 reset the field. From there, Pittman challenged Sweet, at times side-by-side and within a quarter of a second to the No. 49 Kasey Kahne Racing GF1 car. Sweet ultimately won by a half-second margin. Sweet and Pittman are fellow teammates on Kasey Kahne Racing. Schuchart rounded-out the podium. 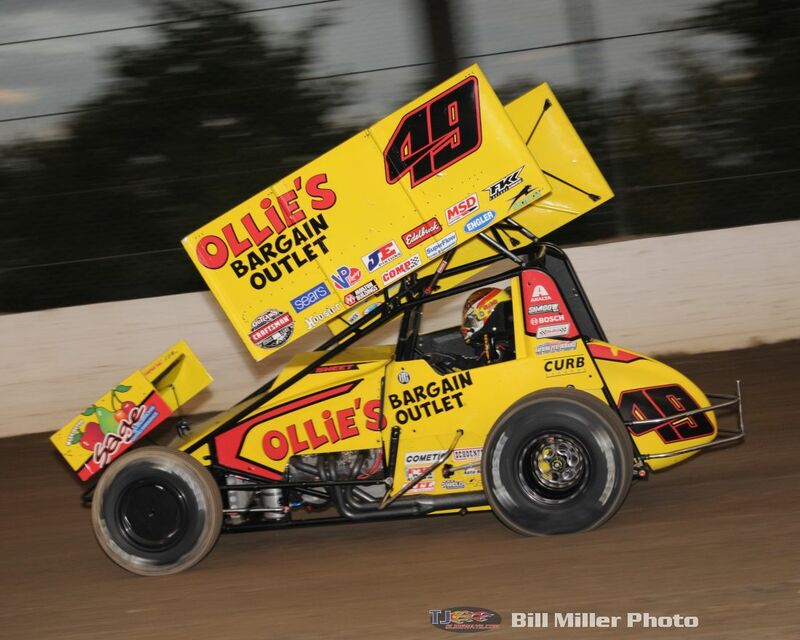 Schuchart carries back-to-back podium finishes into the final regular series race, the O’Reilly Auto Parts Twister Showdown at Salina (Okla.) Highbanks Speedway. Earlier in the racing program, David Gravel recorded the fastest time in hot laps and qualifying, and won his heat race. Gravel’s seventh quick time of the season was a 13.704 lap time. In the first heat, Gravel was the only driver to record a lap time below the 14-second mark.